PediWrap™ Pediatric Leg Immobilizers are cute, comfortable leg immobilizers that quickly and safely control leg movement. They are very effective bandage covers and are highly recommended for splinting the legs to maintain muscle length and joint range of motion. They are also very effective in lower extremity stabilization during weight-bearing activities. The Standard Ankle-Length Immobilizer with Straps features 4" of Velcro® overlap and two 2" wide Velcro® straps for added support. Come as a pair. Please specify whether for boy or girl when ordering. Recommended HCPCS Code: A4570 - Splints. 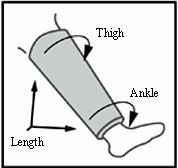 • Holding the leg out, measure the leg from the inner thigh to the ankle. This is the length you need. • Measure the circumference of the upper thigh and the ankle. The Pedi-Wrap is intended to cover the full length of the patient’s leg. It should be fitted as snugly (yet comfortably) as possible around the leg.